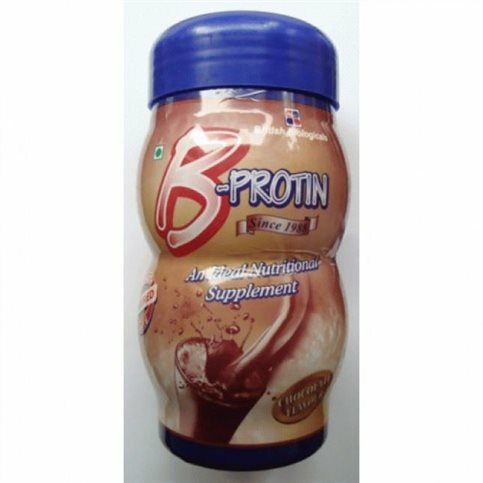 The B Protin powder is a nutritional health drink that is enriched with a blend of Time Released Proteins, Soy, Whey and Casein. These nutrients ensure the continuous supply of Amino acids for formation of haemoglobin,production of enzymes, and maintaining tissues. This B Protin supplement maintains good health, boosts energy level and enhances the immunity system. So is indicated in case of General Weakness, Fatigue, Convalescence, Hospitalised and Immuno-compromised patients. Information B Protin nutritional powder also contains: 28 essential vitamins and minerals. 5 Antioxidants. 3 Best quality Proteins analysed by the PDCAAS (Protein Digestibility Corrected Amino Acid Score). The World Health Organisation (WHO) recommends consuming Protein having PDCAAS 1; as these are easily digested, absorbed and provide all essential amino acids. Cholesterol and Gluten free. B-Protin can be taken with water or milk.